A well-known fund manager who in his previous job generated nearly four times as much money for investors than the broader market is back with a new fund. 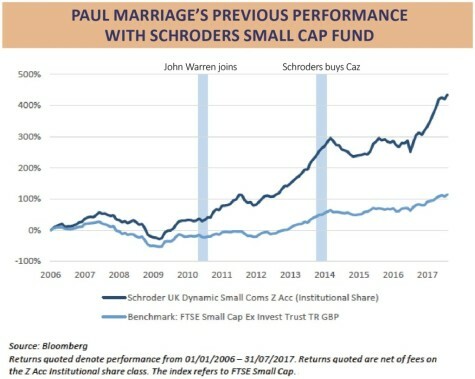 Paul Marriage made his name at Cazenove and Schroders, particularly with Schroder UK Dynamic Small Companies Fund (0721936) which returned 435% versus 114% from the benchmark FTSE Small Cap index in the 11 years he ran the fund. 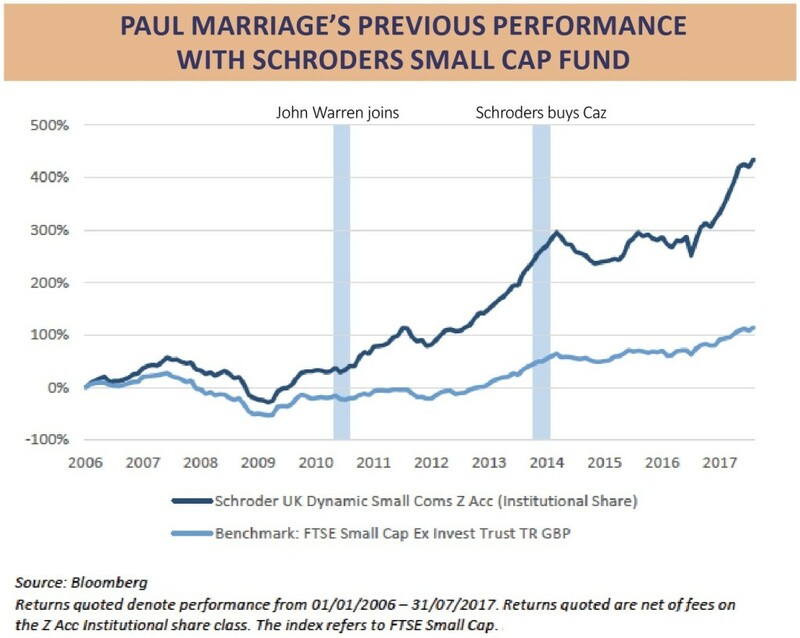 Marriage left Schroders in 2017 and together with former colleague John Warren set up Tellworth Investments. The pair plan to launch Tellworth UK Smaller Companies Fund at the end of November and follow the same investment process as they used at Schroders. The portfolio is expected to have 15 to 20 of the same holdings as featured in the Schroders small cap fund when they left last year. Overall the fund managers want to build a portfolio of 40 to 60 positions with a three-year typical holding period. ‘We had a decent record at Schroders and I’m not going to change the system I developed in 2000. We made good money for investors and I will try to repeat this,’ says Marriage. His process begins by excluding the highest risk areas in the small cap world, namely oil, gas, mining and biotech firms. He also excludes financial brokers to avoid any conflicts of interest. Marriage then strips out companies which aren’t based in the UK, even though he is happy to own qualifying ones that have international operations. He doesn’t want to travel beyond a long train or short plane ride to meet management, plus he wants the flexibility of dropping in on companies if he is near their factories or offices. This process throws up stock ideas and it also highlights ones to drop from the list, leaving the fund manager with a more manageable final 50 names, on average. WHEN WILL INVESTMENTS BE SOLD? New investments are given about six months to prove their worth otherwise they are thrown out of the portfolio. Marriage sells on the first profit warning and also starts trimming once a position has made at least a three-times return. This autumn’s stock market sell-off has seen a lot of high-flying AIM stocks rapidly lose value. Many investors will have been disappointed with this movement, but not Marriage. ‘It gives me great joy to see these highly-rated stocks come back down. It was a long overdue reality check. The fact the top end of AIM is trading on 38 times earnings is nuts. The manager argues the sell-off is good for the launch of his new small cap fund as he can pick up some stocks at favourable prices. Marriage says he’s got his eye on some good quality companies which he’d be happy to buy at 15 times earnings and which are now trading on 12-times. He says diversified hire business VP (VP.) particularly stands out in the current sell-off. Its shares have fallen by 15% since August and now trade on a mere 10.2 times forecast earnings for the current financial year. Retailer TheWorks.co.uk (WRKS) has also caught his eye, saying it is a good quality business with a decent opportunity. It just needs to meet earnings expectations set at its IPO in order to fully convince Marriage. He reckons The Works – as it is better known – is taking advantage of WH Smith’s (SMWH) strategic shift to focus on travel outlets, as that leaves a gap on the high street to offer stationery, school stuff, gifts, books and the latest playground craze. Electronics group Gooch & Housego (GHH:AIM) has been flagged as a likely portfolio holding, boasting a market leading position in its chosen niche, management as long-standing shareholders, and potential for margin growth. Industrials group Renold (RNO) is also likely to join the portfolio, says the fund manager.